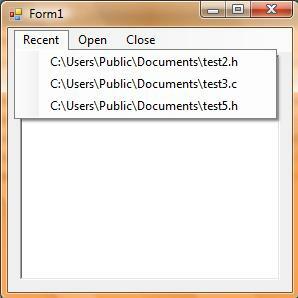 View PDF files in C# using the Xpdf and muPDF library, Print PostScript. Usability & security: Unlikely bedfellows? Learn the role BackOffice components should be playing your applications. Making an Audio Spectrum analyzer with Bass.dll, C# and Arduino – Part 2. What is IoT and Why we need IoT? When creating an application, sometimes it’s useful if you want to create a recent file list as a shortcut to open a previously-opened file. This makes opening a file look simple and handy. This method is called whenever you want to add an item to a list and save it. Usually, this item is a path to a previously-opened file. This method is to load a list from file but doesn’t insert it to menu. Usually, this method is called at form_load and whenever you want to refresh list and list menu. This is a click handler when user clicks the menus. Usually, this reopens a file. So that’s it -simple but useful code.